Well the blog has been on the back burner. We were lucky enough, after nine months searching, to have found, purchased and moved into our own home so life has been more about boxes then fine cuisine. We have been eating pretty well throughout the process and making good use of our fantastic new SMEG kitchen so I’ve got a few tasty meals to update on. Ok. Here is a simple one. We’re lucky enough to finally have access to a great array of butchers in our new area so I purchased some lovely and very reasonably priced lamb loin chops and whipped this up. The lamb is marinated in olive oil and lemon juice and the tomatoes slow roasted. First I put the lamb in a bowl to marinate and the tomatoes in the oven on about 160ºC to roast just a little. I left them in for about half an hour and while I did this I put one cup of couscous in 1 cup of boiling water and waited until it had expanded then fluffed with a fork. In the meantime I had chopped up about 1/4 cup of semi sun dried tomatoes, 1/4 cup kalamata olives and 1/4 cup of fresh flat leaf parsley. I mixed all this through the fluffed couscous then put the lamb in an oiled fry pan on a medium heat for about 3 minutes each side. 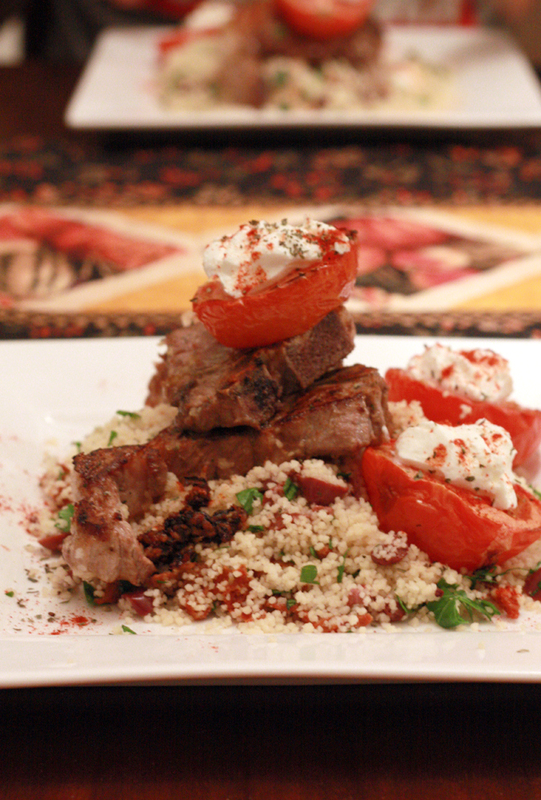 Once ready I served the couscous topped with the lamb loins, the roast tomato, labneh and a sprinkle of paprika.